That's right - after seeing so much amazing talent at the Square Sounds open mic, and the realisation that some of the Square Sounds fans had no idea SoundBytes existed, we realised it was probably about time for some more SoundBytes love! We do have plans for at least one more show later this year (and whispers of international guests) but for now, we have put together what we think is a pretty killer line up, with some of those new faces, as well as some you should, by now, recognise! Facebook event page is here - hope to see you there! 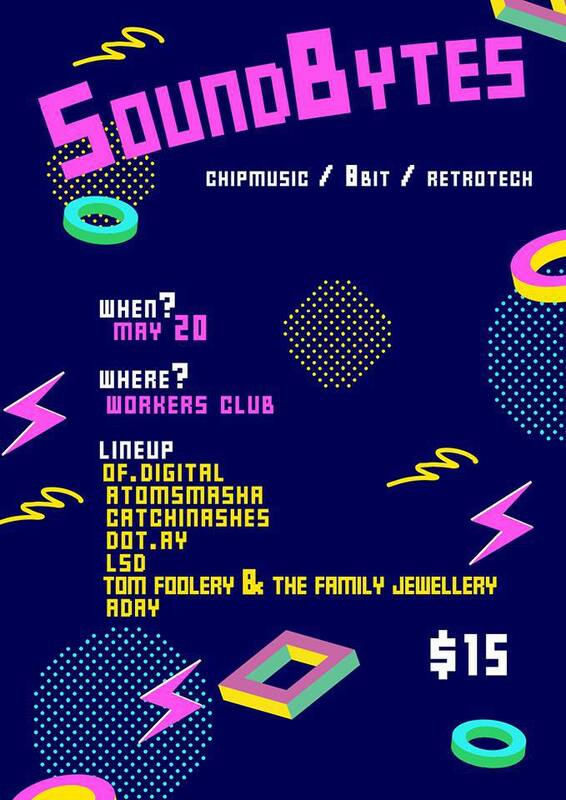 SoundBytes is heading back to our favourite bar Forgotten Worlds to bring you our first (non Square Sounds Festival) show for 2015! We've got some of your favourite chipmusic artists from Melbourne and around Australia, and some new discoveries for you to check out. and all the way from Argentina, Los Pat Moritas! We are very close to D-day for Square Sounds this year, so we just wanted to give you a little update of all the things that you should keep in mind when planning your weekend! Thursday night – Pre Party. Catch some awesome people’s open mic sets, or perform one yourself. We have sets from Aday, Stray.CE, cTrix and a special international guest – Cerebral Scars, all the way from the UK. This is at Melbourne’s best bar, Forgotten Worlds, which combines old school arcades with an awesome selection of boutique beers from all over the world. Friday night – Night one. Catch Bubbletown Babe Crew (VIC), Alex Lane (NSW), DFO:BAD (NSW), Eyeliner (NZ), xyce (NL), Galaxy Wolf (UK), NNNNNNNNNN (JP) and Chipzel (UK) playing night one. Lots of Gameboy this evening, and given the buzz about Chipzel being in town that we are getting from press (Cyclic Defrost, Zen Arcade and VICE and more have all been chatting to her!) she’s going to be one you don’t want to miss. But we’re also really excited about Eyeliner – who you may also know as Disasteradio. One of our non-chip performances, his music is inspired by vaporwave, with chippy elements. Think 80’s, think digital, think synthesizer. Saturday night – Night Two. Night two packs in even more bass, a wider variety of sounds and consoles, and one of the legends of gaming music – Chip Tanaka (his day job at Nintendo had him working on everything from Donkey Kong’s sound effects to Super Smash Brothers Brawl). A legend in Japan, his live set is decidedly non-gamey and you are going to love it! Other acts for the night are MEN64 (NSW), Chr15m & Fenris (WA/VIC), GN (QLD), Atomsmasha (WA) (with guest visualist Kataplexia), Goto80 (SE), Toriena (JP) and the return of Henry Homeweet, who brought the housedown with his SoundBytes set some 5 years ago… and you might want to stick around to the end as we have a very special secret set planned! Sunday night – Post Party. The post party is the best way to recover from a full on weekend of heavy bass and hard drinking (because let’s face it, that’s what happens) by hanging out in a beer garden, hearing DJ sets that are chip inspired or by chip artists doing their ‘other’ stuff and hopefully soaking up some sunshine (the long range forecast is looking good!) and hanging out with the new friends you’ve made over the weekend. We have sets from Henry Homesweet, Velatix, B.O.O.M.A, Package Holiday, DJ Innes, Talkshow Boy and Melt Unit and this is always our favourite part of the weekend!